For people living in Pune, the village of Ralegan Siddhi is not such an unusual choice for a day picnic, though I was surprised at how eager my family members were to visit the place when I suggested it. I suspected that their enthusiasm might have something to do with the fact that the village has frequently been in the news, since it is best known as being the home of political and social activist Kisan Baburao ‘Anna’ Hazare. As I soon found out, they were not alone: Ralegan Siddhi has firmly established itself on the tourist circuit for both Indian and Western tourists alike. 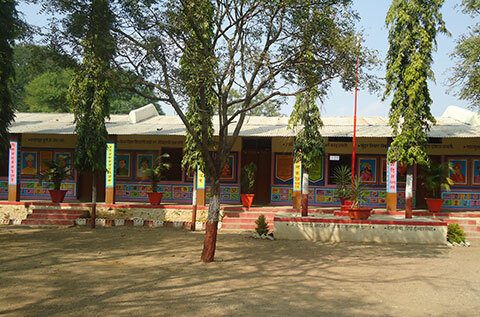 Ralegan Siddhi’s colourful primary school. Photograph by Sangeeta Mulay. Refreshed, we drove on towards our destination. As we got closer to Ralegan Siddhi, the landscape started to look increasingly greener. A narrow, dusty road led us into the village, and we soon came across Sant Nilobarai Vidyalaya, a school that admits pupils that have repeatedly failed exams in other schools. It was a novel (and noble) idea, I thought: after all, aren’t schools meant to offer help to those who need it the most? There are a number of huge banyan trees in Ralegan Siddhi, but the banyan tree in the centre of the village was one of the most majestic trees I had ever seen. We asked for permission to picnic under this sprawling giant and thankfully, we were allowed to do so. What little picnic food we ate tasted much better under the tree’s generous shade. Next, we walked over to the museum of Ralegan Siddhi, where visitors can learn about the various conservation and sustainability programmes that the villagers had initiated. It also contains a room that houses the numerous awards that Anna Hazare and his villagers have received over the decades, chief amongst them the Padma Bhushan (1990) and the Padma Shri (1992) awards, presented by President R. Venkataraman. 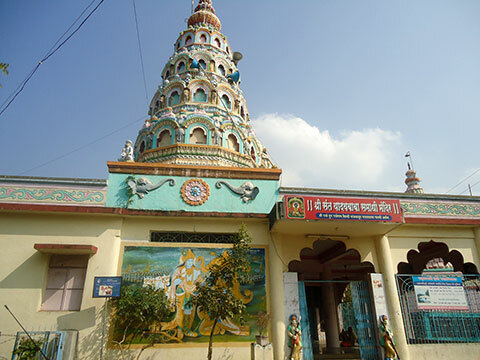 The Yadav Baba temple in Ralegan Siddhi, inside which Anna Hazare used to reside. Photograph by Sangeeta Mulay. 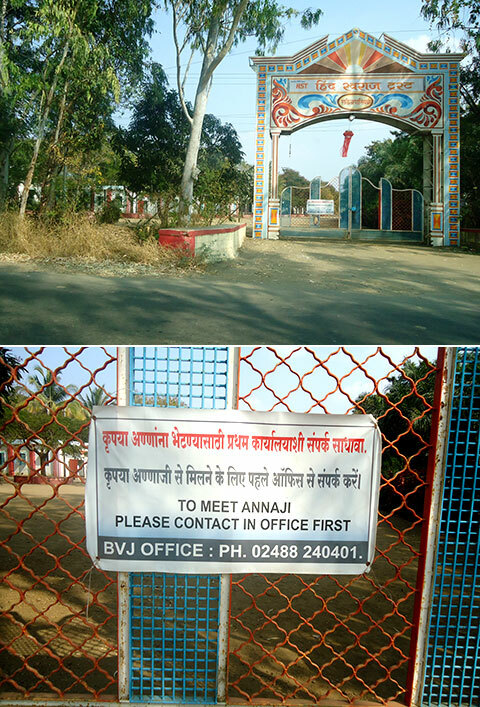 Anna Hazare’s influence can be seen in almost every aspect of the village. The Yadav Baba temple inside which Anna used to reside was renovated with his own provident fund savings and used to serve as a common meeting place for all the villagers. Anna continued to live there until the media arrived in the village and their intrusions made it impossible for him to do so. Next to the temple is the colourful primary school with inspiring slogans painted all over the walls. The school children volunteer their time and effort as part of shramdaan (volunteer work) and help in the upkeep of the village. The is stress on the importance of physical training in the school—several children from the village go on to join the armed forces. Ralegan Siddhi, with a population of 2,300, is small and immaculately clean. Though it is located in a water-scarce area, the village has been remarkable in the way that it has reinvented itself under the leadership of Hazare. In the late ’70s, in a determined effort to solve the water problem, a series of bunds, reservoirs, and canals were constructed all over the village through shramdaan. The required funding came either in the form of donations or bank loans. Water conservation was made a priority. The growth of water-intensive plants was discouraged and water was managed and regulated. Dairy management was also encouraged as an additional source of income. Over four lakh trees have been planted in the village since then. The greater availability of water has led to an increase in agriculture in the village. All these measures led to a rise in the income of the villagers and in turn the village as a whole started to prosper. The methods used to bring about a change in the village were successful because the intent was ethical and transparent. When some Dalit families in the village could not repay their bank loans, the rest of the villagers helped them by toiling on their land and harvesting crops, thereby enabling them to raise the money to repay their debts. The entrance to the watershed development centre and the sign at the gate. Photographs by Sangeeta Mulay. Drinking alcohol is banned in the village and was punishable by public flogging until the village managed to drive out alcoholism. Vegetarianism is strongly encouraged. Cigarettes and tobacco in all its forms are banned from the village—and no one is complaining. Having seen it prosper, the villagers are fiercely proud and protective of their village and its most famous resident. Furthermore, the now constant media attention somehow seems to reinforce their belief that Anna’s way is the right way. Inspired by the water conservation methods used in Ralegan Siddhi, the Maharashtra government launched the Adarsha Gaon Yojana (model village program) in 1995, under the guidance of Hazare. The aim was to make villages healthy, happy, and self-sufficient, with monetary help and guidance from various N.G.O.s and government departments. Anna himself has replicated the watershed development programme in at least four other villages. His aim was to make at least a hundred other villages benefit from the adarsha gaon programme. Unfortunately, barring a few, not many villages have taken up this challenge. Whether this is due to a lack of an inspirational Sarpanch willing to galvanise the villagers and push them is debatable. The watershed development centre in Ralegan Siddhi was established to provide training on watershed management, crop patterns, and dairy management, as there was a lack of trained manpower in the village. As we walked in, a placard at the gate informed us to contact the office if we wanted to meet Anna Hazare. We ignored the instruction and continued to explore the premises of the centre. Tamarind trees flanked our path and stern signs warned us of fines that would be imposed if anyone tampered with the leaves or fruits. The Anna effect was in full force here. We soon came across a locked room, outside which we found four sleepy havaldars seated next to their outdated rifles. The friendly policemen indicated that Anna was napping inside, while allowing the younger members of our group to touch and marvel at their guns. Several people were sitting patiently on mats under the tamarind trees, waiting for Anna to emerge from the locked room. 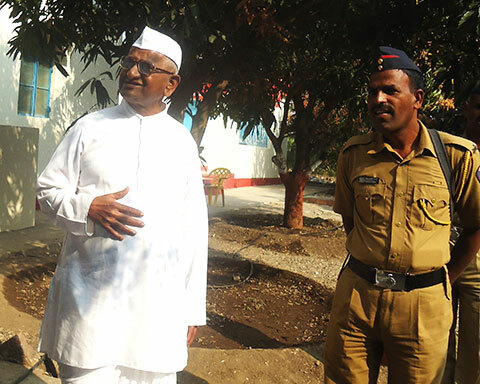 Anna Hazare smiled as people came forward to meet him. Photograph by Sangeeta Mulay. Somehow, I didn’t think that it would be so easy to meet a prominent personality like him. However, we were all pleasantly surprised when Anna Hazare nonchalantly walked out to meet everyone. He smiled as people came forward to meet him. Someone mumbled something about him giving hope to our nation. Several people bent down to touch his feet. He requested people not to do so, but blessed them graciously nevertheless. His modesty was completely disarming. The man is well-known the world over and yet he readily meets not only the Very Important People but also the inconsequential, the simplest of them—the aam aadmi (no pun intended)—sometimes at the cost of great inconvenience to himself. Later, the realisation hit us that we had met a man who was bound to go down in history as somebody who shook this slumbering nation of ours out of its lethargy and set forth the movement for change. So far, we had only witnessed India’s period of transformation via a television screen, and this chance meeting was highly significant and meant a lot to us. It is no secret that since 2001, farmers have been committing suicide in India once every half-hour. India and her villages need more people like Anna Hazare and adarsha villages like Ralegan Siddhi to set a precedent. By Sanchari Sur · Labels are not easy to live with, especially hyphenated labels. There is a sense of disorientation when it comes to choosing one side or the other.